Antecâ€™s Formula 6 thermal compound protects your CPU even when your rig is running on all cylinders. Since little of the CPUâ€™s surface actually touches the heat sink, you need a solution that isolates and facilitates the transfer of heat. Formula 6â€™s nano diamond particles minimize the distance between heat-conductive compounds and gladly take on the highest demanding CPU, optimally performing between -30Â°C and 250Â°C. 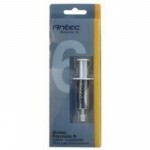 To keep your system cool and your CPU functioning comfortably, pick up Antecâ€™s Formula 6 for a diamond-caliber solution.